Dominic Thiem will meet Gilles Simon in the final of the Lyon Open after both players came through tricky tests on Friday. 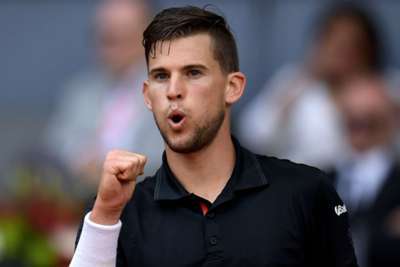 Thiem battled his way past Dusan Lajovic of Serbia 6-4 5-7 6-4 to continue his good form on clay this season, the Austrian having won February's Argentina Open, before reaching the final at the Madrid Open earlier this month. The top seed had also been on court earlier in the day, finally seeing off Guillermo Garcia-Lopez in three sets in a delayed quarter-final clash that was halted on Thursday due to bad light. As for Simon, he had to stave off a pair of set points in the second set to win 6-1 7-6 (8-6) against first-time semi-finalist Cameron Norrie from Britain. The experienced Frenchman will hope to end a five-match losing streak against Thiem, who will be bidding to win his 10th career title and second of the season. Qui arrêtera @fucsovics ? Après avoir éliminé Stan, le hongrois s'est défait de @SJohnson_89 2-6 / 6-4 / 6-1 et file en finale affronter l'allemande Gojowczyk. At the Geneva Open, Marton Fucsovics moved just one win away from becoming the first Hungarian to win an ATP Tour title since 1982. Fucsovics rallied from a set down to see off sixth seed Steve Johnson 2-6 6-4 6-1 and reach his maiden final. If he can triumph again on Saturday, the world number 60 will follow in the footsteps of compatriot Balazs Taroczy, who was the last Hungarian to win an event, at Hilversum, 36 years ago. Peter Gojowczyk will be Fucsovics' opponent after upsetting second seed Fabio Fognini in straight sets. Having already knocked out Ivo Karlovic, David Ferrer and Andreas Seppi, Gojowczyk continued his impressive run at the tournament with a 6-4 6-4 triumph over his Italian opponent.